The Moto G (2015) is the third generation of Motorola’s mid-range handset. It sits between the cheaper Moto E and the flagship Moto X, with a price rise taking the 8 GB model to US$179/£179/€229. At that price it's up against some serious competition. Our Moto G (2015) review finds out whether water protection, a 13 MP camera, LTE and individual looks are enough for it to stand out. The Moto G (2015) price is higher than that of its predecessors. The 8 GB model starts at £179/US$179, rising to £209/US$219 for the 16 GB version on Moto Maker. However, those prices are already being undercut in some markets: for example, at the time of writing, MobileFun is listing 8 GB models for £159.99 in the UK. Most retailers will only have the basic model. Protective covers add another £24.99/US$29.99. The Moto G (2015) release date was the same as its announcement date: July 28, 2015. The Moto G (2015) looks more premium than its predecessors, with a design that’s strikingly - some might say confusingly - similar to the Moto X (2014). But because this is a mid-range handset, the casing is plastic (although the version with the black display bezel has an anthracite edge). Don’t let the apparent symmetry of the design fool you: this time around Motorola has dumped the stereo speakers, removing one of the coolest features of last year’s blockbuster. More of that later. The screen feels just like the Moto G 2014 - just big enough to feel good in one-handed operation - and the power button has been tweaked to make it easier to find by feel. The top right-hand buttons are now aluminum, and the phone comes in white and black. One of the key selling points here is customization. You can choose from 10 different colors for the back shell, 10 colors for the trim strip and five colors of foldable protective cases. Sadly whichever color you choose, the back is rubberized rather than wood or leather like the Moto X.
There’s not much new to see here: the display squeezes in just below the five-inch mark with a panel delivering 1,280 x 720 at 294 ppi. The Moto G (2015) features a display protected by third generation Gorilla Glass. While it’s hardly at the cutting edge of display tech, it’s got decent viewing angles, good brightness and excellent color reproduction. It’s noticeably better than the Moto E and gives the Nexus 5 a run for its money. There’s one area where it didn’t do as good a job as the Nexus, however, and that’s the touchscreen accuracy. We found the error rate using the one-line Minuum keyboard was significantly higher on the Moto G than on the Nexus 5. That might be an issue that only we would notice, but we thought we’d better mention it. The Moto G 2015 features a SIM card with a dual-function chip packing a smart mode, which enables the use of 3G or 4G mobile data. The SIM chip automatically works in 2G frequency, eliminating the need for users to change it manually. In addition to this functionality, the app that manages the SIM chip is able to suggest the best carrier at any given moment. Bad news for deep sea divers: while the Moto G (2015) is IPX7 certified for waterproofing, that only means it’s good for half an hour in up to 1 m of water - and the screen doesn’t work while it’s underwater, so you won’t be taking this one down to the depths. And while the phone has been made water-resistant, it isn’t dust-resistant: so get some grime in there and you can say bye-bye to your warranty. The Moto G (3rd gen) is available in a whole host of eye-catching designs thanks to Motorola's Moto Maker store. You can even have a short personal message engraved on the rear of the phone for an additional five bucks. Unlike some firms, Motorola doesn’t mess around too much with Android, and the Moto G (2015) specs support a virtually untouched Lollipop 5.1.1. The only tweaks are tiny details, such as a simple gesture control, a wizard to automate some tasks and the interactive notifications on the lock screen. We like the gesture control for the flashlight, which involves a double karate chop, and the wrist-twist that brings up the camera. Motorola doesn’t appear to like Lollipop’s multi-user feature, however, because it’s absent here. The Moto G (2015) can display alerts on the screen even when your phone is on standby. There’s also an intelligent assistant that can automatically mute your Moto when you’re in a meeting, arrive at a certain place or fancy a nap. Both versions of the Moto G (2015) will run on the Snapdragon 410 processor, but the entry-level model gets 8 GB of storage and 1 GB of RAM, while the more expensive model doubles those to 16 GB and 2 GB respectively. On paper it’s effectively running the same engine as the cheaper Moto E, but the news is actually better than that: in some benchmarks the Moto G (2015) specs perform 20 to 30 percent faster, and the Snapdragon’s power-sipping strengths means that the always-listening Moto G’s background services don’t have a catastrophic effect on battery life. It’s no slouch by any means, but when you look at the specs of rival devices in this sector, it’s clear that even the most expensive 3rd-gen Moto G is only just keeping pace with what other firms are offering for similar money. If your idea of heavy phone use is a bit of Angry Birds 2 and some Facebooking then the Moto G will be fine; while performance isn’t stellar, it’s okay for everyday activities. If you’re into more demanding applications, especially games, then you may have to look elsewhere. The AnTuTu benchmarks rated the Moto G (2015) poorly, and while Real Racing 3 was playable, it suffered from noticeable jaggies and missing detail. We think Motorola has made a big mistake with the 3rd gen Moto G's audio. Where the Moto G (2014) had stereo speakers at the bottom, the 2015 model is mono. Motorola’s software equalizer can add a little bit of depth, but there’s only so much it can do. The previous version sounded a lot better. If you like photographing food, you should buy the Moto G: its macro mode and focus effects are so good you might end up falling into your soup. The main camera is 13 MP with HDR and burst mode for dramatic and fast-moving shots respectively, but pay close attention to the color of your shots: the first test unit we tried had a very obvious reddish tint, although our replacement didn’t suffer from the same problem. Such problems aren’t completely unusual with review units - sometimes the final polish hasn’t quite been done - but you might want to check out the forums to make sure this isn’t an ongoing issue with production models. On paper, the Moto G (2015) should have excellent battery life: its processor isn’t too greedy and the battery is a hefty 2,470 mAh. However, the Moto-Info service that displays every notification outweighs them, and the result is that the Moto G (2015) has distinctly average battery life in real-world use. We got between five and eight hours of use before having to recharge. Qualcomm’s processor supports fast charging, but unfortunately the Moto G doesn’t: Motorola appears to have kept that feature solely for its flagship Moto X. The battery isn’t replaceable either, so this is a phone you’ll definitely have to replace two or three years down the line. The 2014 Moto G was a price/performance powerhouse, offering much better hardware than the competition at a fantastic price. With the Moto G (2015), however, Motorola appears to be trying to move a little upmarket, and while the Moto G is fantastically customizable and has a great camera, the rest of its specs are unimpressive. That’s particularly obvious when you look at similarly priced devices such as the Huawei P8 Lite, or Motorola’s own and only slightly more expensive Moto X (2014). But for the Moto G (2015) price, you've got some interesting competition. What do you think? Does the 3rd generation Moto G look as attractive as the second? 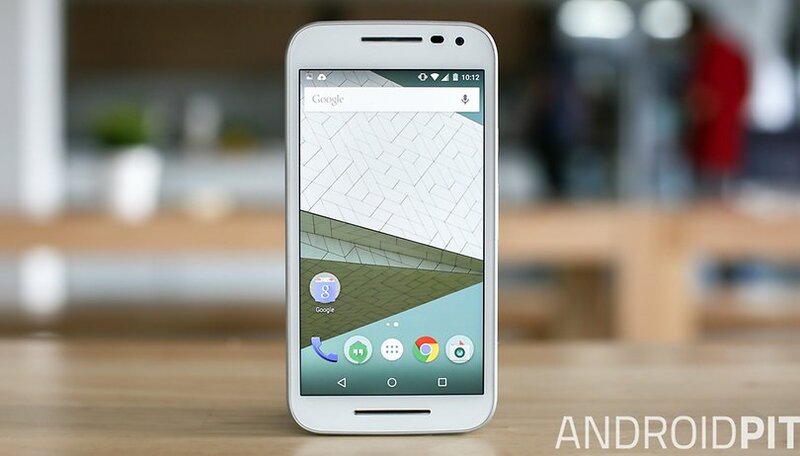 Motorola Moto G (2015) - where to buy? You can buy the Moto G online from Motorola (and customize its design) via the Moto Maker site, or you can get it slightly more cheaply from Expansy or Mobilefun in the UK. In the US you can also pick up the Moto G 3rd gen from Amazon or Best Buy. Quick comment for potential Motorola G 2015 buyers. It doesn't seem to have a gyroscope so you won't be able to use photo spheres using the Google camera app. Small detail but interesting to note as it was possible on the 2014 version. Correct me if I'm wrong. Can someone put this into perspective for me? Im not an Android user but my GF has a One M8 would this be considered an upgrade, downgrade or a wash? I've kinda looked at specs, I know the one m8 is an 801 SoC and this is a 4 series, but I don't know if 4 is newer and therefore more efficient or if it's a dog compared to the M8. Thanks! Awesome, thanks man! Thats exactly what I was looking for!